Optimize the seo of your site, in order to reach the first place on Google. This module simplify your life helping you to fill very quickly the meta tags wich are usefull to reach the first place in the search engine results like Google. In few minutes you will optimize the SEO of your site instead of working dozens of hours. Optimize your positions on Google and others search engine. 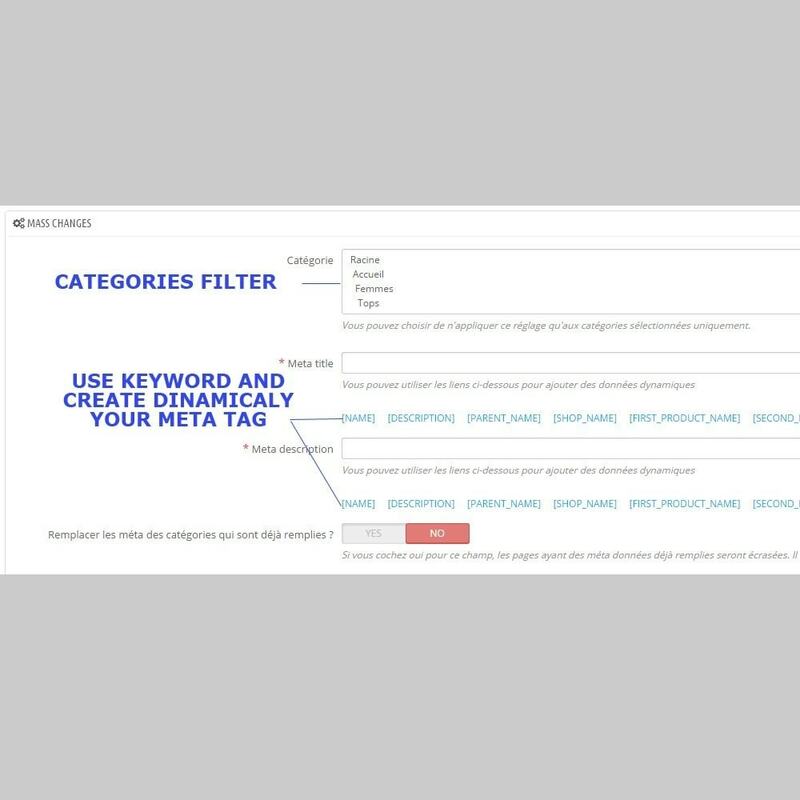 With this module you will be able to fill in few minutes the title tag (meta title), and description tag (meta description) of each pages of your site and the legend (alt tag) of your products images. The meta title and meta description are the most important tags for SEO. Both allow to specify to the search engine the thematic of your page. But it also very usefull for the display in the search engine results. The title tag is the one wich will be in bold in the search engine result and the description tag will be use for the description of this result. To have meta tag correctly filled increase the SEO and engage users to click on your link in the search engine results. To have alt tag empty or incorrectly filled will have a negative impact on your SEO. The alt tag is the only way for search engine to know what a pictures is talking about. 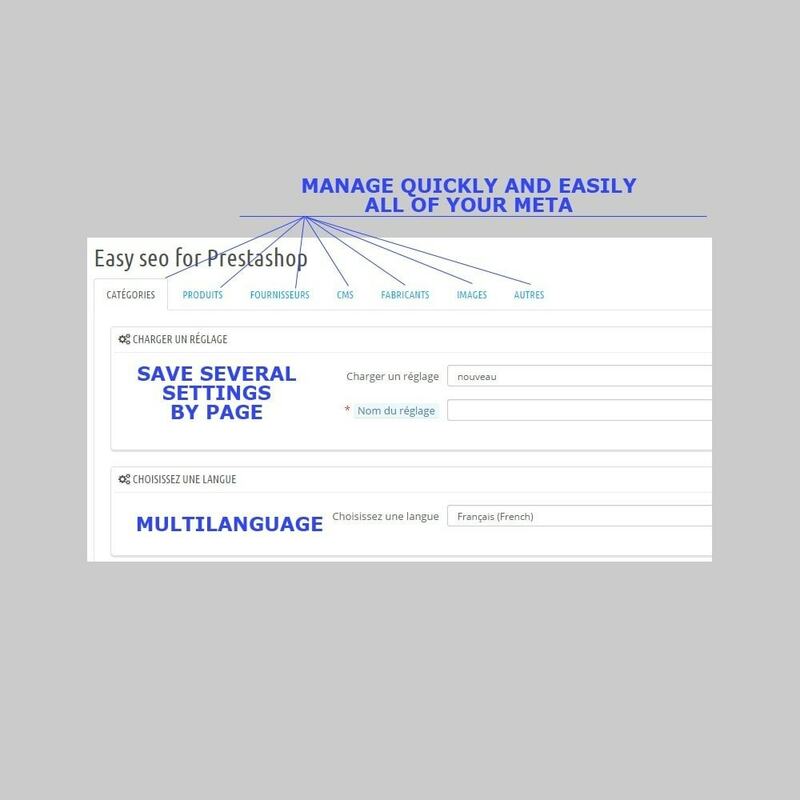 More, Prestashop do not allow to modify alt tag of pictures that have already saved on your site. So, if you never correctly filled your picture, you will have to saved all of your pictures again... except if you use this module ! You will be able to update manually all your meta in few seconds or choose to update them automatically and let the module work for you when you are sleeping ! With this module you can modify and alter every existing order in your store, also after the purchase is completed. The first benefit for your customers is to find your site easily in the search engine results. This module will allow you to create links that will open popup (lightbox) wherein you will be able to add what you want. Your customers will have more informations without the need to leave your product page.